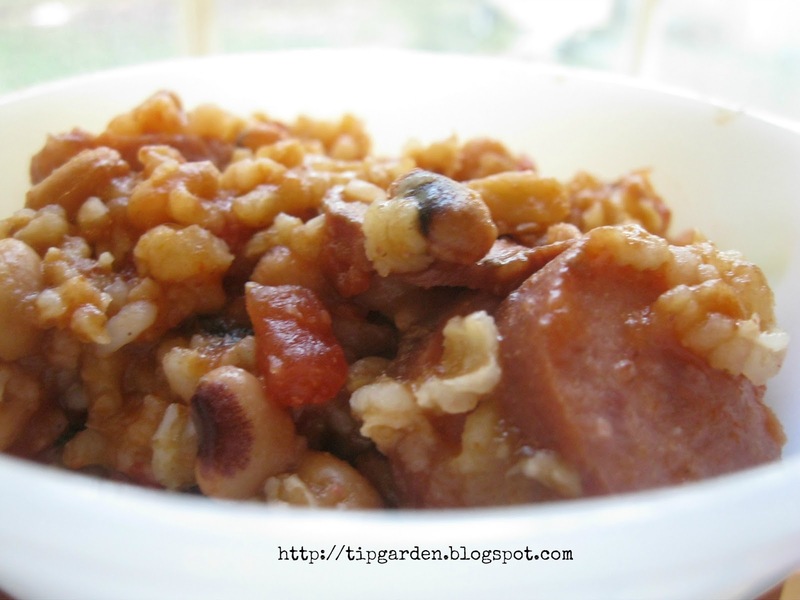 Hoppin' John Chowder is a classic Southern New Years tradition. Eating it on New Years day is thought to bring you a prosperous year and good luck. The black eyed peas are supposed to be symbolic of pennies or coins. Serving it with cornbread brings additional luck, as the cornbread is the color of gold and thought to add to your prosperous chances. Hey, we all need all the help we can get right? So, what exactly is Hoppin John Chowder? Traditionally it is rice, beans, and bacon or ham. My version is inspired by Southern Living's Slow Cooker cookbook. It uses Kielbasa and is really yummy. The original recipe made a whopping 18 cups and would feed a small army. I cut it in half here and it still filled my 6 qt. crock pot, so keep that in mind. Cover and cook on HIGH 20 minutes or till rice is tender. Combine all ingredients including the rice into a 6 qt. slow cooker. Cover and cook on WARM if you have that setting, low if you don't for 5-6 hours. Jan's Tip: I used option 2 in the picture above. I cooked mine on the warm setting all day and it worked out perfect. If I were to do this again, I'd probably double the broth and water (or add a can of tomato sauce too!) but leave the rest of the ingredients as is.